This is another one of those pictures that looks fine at first but has something really weird nestled at its heart, so that the longer you look at it the stranger you find it. As far as demonstrating Phantom Girl's powers, the ol' "jaunty traipse through the atoms of a table" gag is a pretty fair representation of what she's all about. 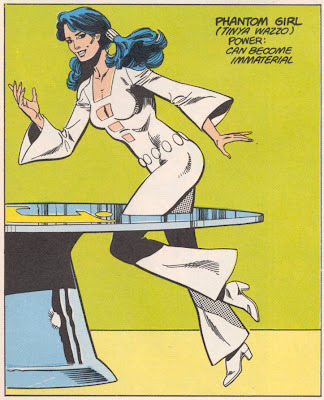 And you can't beat the patented Phantom Girl skin-tight, flared-sleeve, bell-bottomed, cut-out pant-suit as far as costumes go. No, what's bugging m bout this picture of PG is her hair. Why is her hair so big? It's kind of like the artist was determined to draw her with great big glam hair like Dream Girl but then had the law laid down upon 'em re: Phantom Girl having pig-tails but then rebelled against hair-fascism by making giant poofy glam pig-tails. And twenty years later? Twenty years later those things are freaking me out, man.